If you would like to donate in US Dollars, click here. Matt and Rebecca grew up together as family friends near Baltimore, Maryland, USA. After pursuing separate interests for many years (including the start of Matt’s flying lessons) the Lord brought them together again in 2006. They were married in 2007 and moved to Sydney, Australia for a job opportunity for Matt. Matt worked as the Director for Sales and Marketing at a prosthetics company in Sydney, and Rebecca taught English as a Second Language to adults. After a few years, they learned at a missions conference about MAF’s work, and it wasn’t hard to see how God had sovereignly combined their individual gifts with their joint desire to serve Him cross-culturally. In 2012 they began working to meet MAF’s requirements. Matt and Rebecca, along with their three children – Luisa (6), Oscar (4), and Rosalie (2) – are currently located in Gapuwiyak, Arnhem Land, Northern Territory, Australia. 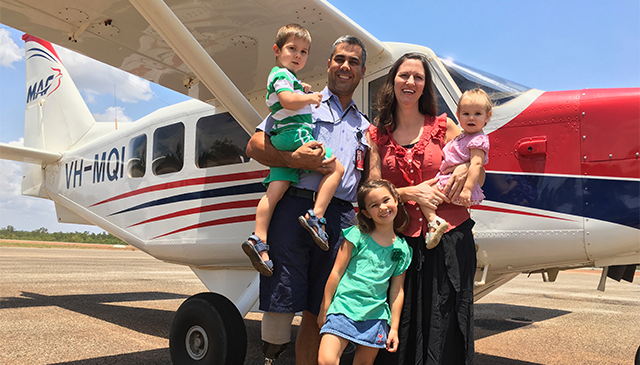 Matt is serving as a pilot to remote communities among the Yolngu people, and Rebecca is homeschooling the children and immersing herself more in the local language. They are excited to return to Arnhem Land for a second term of deepening relationships and learning more about the culture, while learning better how to communicate the tremendous gift of eternal life that we have in Jesus Christ.